The Optoma ML300 resists easy characterization. 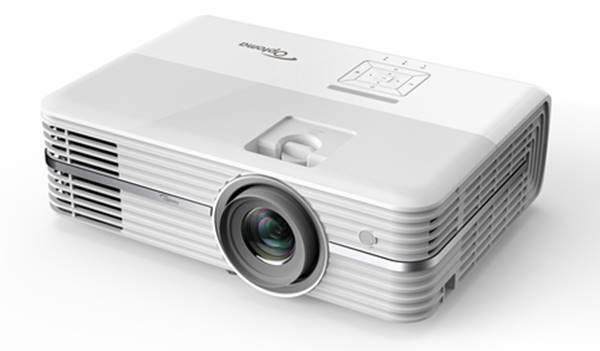 On the one hand, it's another example of a group of similar projectors that are built around LEDs and a 1280x800 DLP chip. On the other hand, while most of these projectors are minor variations on a theme -- or, more precisely, two themes, one for 500 lumen models and one for 300 lumen models -- the 300 lumen ML300 strays from the norm. Not all of the differences are in its favor. For example, although it is only 2.1 lbs., it's closer in size to 500-lumen models than to other 300-lumen models, making it a little less portable than it could be. However, the large size gives it room for lots of ports, including a standard VGA rather than an oddball connector that needs a separate adaptor as with other 300-lumen models. Very much on the plus side, you can leave bulky laptops at home and let the ML300 read files from microSD or microSDHC cards, USB memory keys, or its 2GB internal memory. If you prefer using a laptop or other image source, however, it offers a reasonably full set of connectors, including a mini-HDMI port. Given the $499 street price, this all adds up to an attractive balance between capability and cost. Good data image quality. The ML300 did a good job on data image quality in our tests. Colors were fully saturated and eye catching in all brightness modes, and color balance was good, with suitably neutral grays at various levels from black to white in most modes. The brightest shades of gray were a touch yellowish in the brightest mode, but the bright modes in most projectors have inaccurate color so you can't really count this as a problem. Also worth mention is that text is crisp and readable at small sizes. In my tests, with a 77" diagonal 16:10 image, text as small as 7 points was easy to read, as long as I was close enough to the screen to read it. Even from a distance of 6 to 9 feet, I found black on white text easy to read at sizes as small as 7.5 points. Usable video quality. The ML300's video quality isn't in the same class as its data image quality, but it's watchable. Skin tones were a bit oversaturated, but I didn't see any motion artifacts or posterization (colors changing suddenly where they should change gradually). The projector also did a good job with shadow detail, with no problems on carefully lit dark scenes, and only a minor loss of detail on test clips that many data projectors have serious problems with. Few rainbow artifacts. For those who see rainbow artifacts easily with DLP projectors, as I do, the ML300 offers the advantage of hardly showing them at all with data images, and showing them only a little more frequently with video. In my video tests they showed primarily in one test clip that's prone to causing them. In most scenes they showed up rarely or not at all. Most people probably won't see any of these artifacts and even those who are sensitive to seeing them probably won't see them often enough to consider them annoying. Highly portable. At 1.5 pounds by itself, and 1.8" by 7.2" by 4.4" (HWD), the ML300 is roughly equivalent to a beach book in size and weight. Adding in the power block raises the weight to 2.1 pounds and gives you two pieces to carry. However, Optoma provides a soft carrying case with enough room to hold the projector, power block, and any cables, USB memory keys, or memory cards you need to carry. Even the fully packed case is small enough to fit easily in a briefcase. Low running costs. As with most LED-based projectors, the red, green, and blue LEDs in the ML300 are meant to last the life of the projector, with a 20,000 hour rating, and no need to buy replacements. hello. i just bought a optoma ml300 and,after 1 hour of working is starting to get hot and shut down ...is working more when in the room is very cold..usually is working like the..or this one got a problem? thank you! Why ony one USB port, which is used by the memory stick, leaving none for the remote controller's USB? I bought a Optoma ML300 for my Corp- Office , and after 10 - 15 minutes of working, a ( fan+caution ) symbol is coming and projector gets shut down. We're from Kuwait and we purchased from X-Cite by Alghanim Electronics. Then I gave back to their customer service center , they checked and they returned after testing. Still I'm facing the same problem. What should I do? stop using it - put it away! HI I bought ML300 a week ago. Product has over heating problem and gets switched off after a sign on screen shows that fan is not working. Every time when i switch it on , at least once in 10 minutes the over heating and switching off happens. I can not return this product because I am outside US and bought this while coming from US. Any suggestions how to over come this. Thanks. I bought it one year ago, and since the second month starting getting hot and shutting down, the customer service is terrible, I have returned the item 3 times and I am having a hard time getting another one, I suggest to pay a differente and get another model, but optoma did not accept. They advertise the product saying that you do not have to replace a bulb like regular projectors, and that is just right, because you have to replace the whole crap of unit. bottom line.. "DO NOT BUY LED PROJECTORS FROM OPTOMA"
I had the fan problem also. After I sent it back like 5 times they got the problem fixed. Now I am trying to use it with every device I have. How do I connect it to my Android phone? Do I need a micro USB to mini HDMI cable? I am unable to my Optoma ML300 to work with my Surface Pro3 using the USB mini port. I am unable to download drivers when I connect to the USB. Please send me a link to download the drivers. Overall, I am pleased with the ML300. I have used with my laptop with no issue. It has met all of my mobile presentation needs.